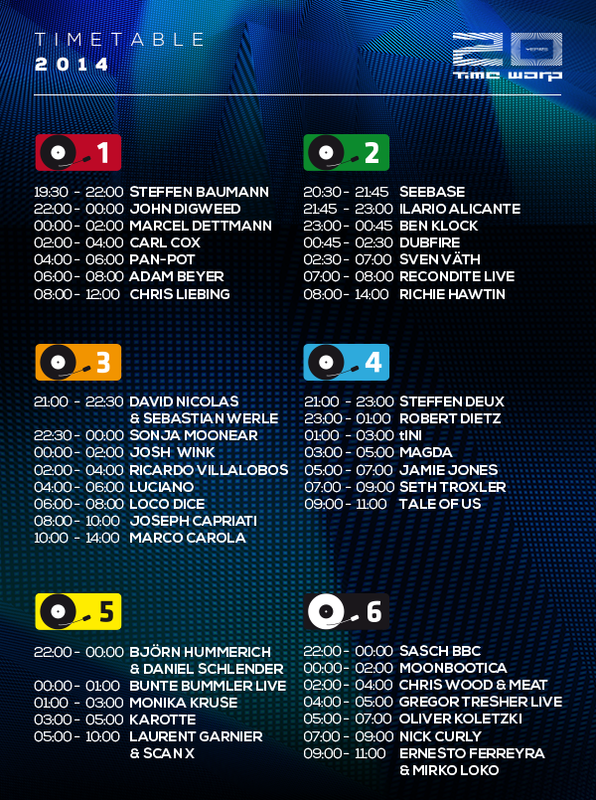 This weekend the world’s leading techno artists will come together to celebrate the 20th aniversary of Time Warp. The full timetable for the event is revealed below and includes a momentous 5-hour set from Laurent Garnier in what will be his 20th appearance at the festival, having played there every year since the very beginning. Richie Hawtin will also play an extended 6-hour set and there will be some Time Warp debuts from Recondite and Sonja Mooonear amongst others. With just a few days to go, Time Warp festival reveal the timetable for the 20th edition of Time Warp Mannheim, which takes place on Saturday 5 April featuring the world’s leading techno artists including Laurent Garnier, Sven Väth, Richie Hawtin, Recondite, Ilario Alicante, tINI, Seth Troxler Carl Cox and Tale Of Us. Over the last 20 years Time Warp has become an institution for electronic music lovers, with loyal fans from all over the globe making an annual pilgrimage to witness marathon sessions from techno’s finest, surrounded by stunning lighting and visual technology. This years line-up includes a special performance from Laurent Garnier in what will be his 20th appearance at the festival. Time Warp regulars Sven Väth, Richie Hawtin, Ricardo Villalobos and Carl Cox will also perform. Acts making ther debut at Time Warp this year include Recondite (Live), Ilario Alicante and Sonja Moonear plus Mannheim-based live-act Bunte Bummler will play a live set featuring a selection of unreleased, never-before-heard tracks.